Here we are with yet another haul! 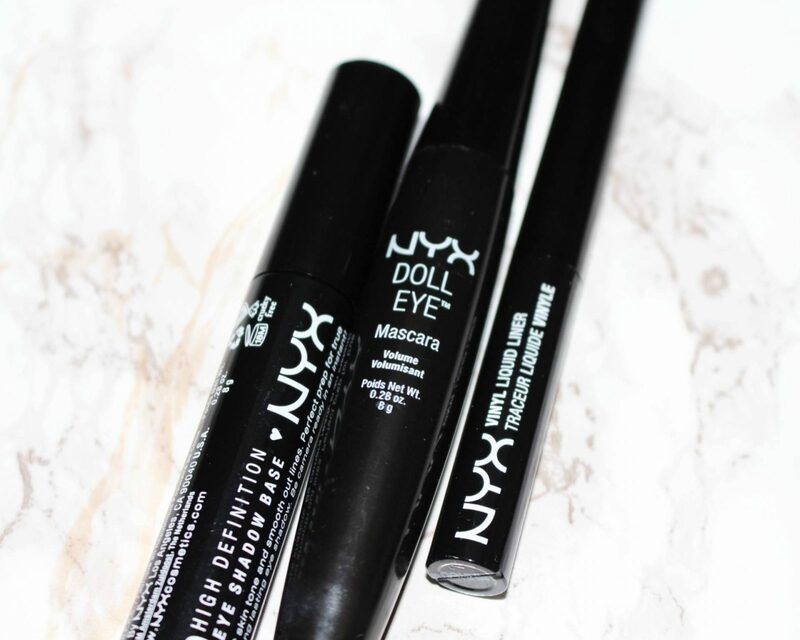 This time round, we’re talking all things NYX. The novelty of having NYX in the UK really hasn’t worn off yet; every single branch of Boots with a NYX counter sees hundreds of makeup lovers swarming the stands. Similarly to the MAC haul, this is two shopping trips combined. That being said, if you were to include the number of times I’ve visited said counters in search of the HD Studio Finishing Powder in Translucent, we’d be well into double figures. I’ve given up on that! I’ve also made a video on my NYX haul, which you can watch HERE. In the middle is the NYX Doll Eye Mascara. This recently featured in my summer favourites; I picked it up right at the end of summer and have been using it constantly since. Normally I prefer an edgy, almost clumpy lash look; this has been a welcomed change! This mascara separates the lashes brilliantly, just like a doll’s lashes (and I LOVE the doll look!) and gives them a bit of volume and length as well. I’m loving a softer lash look with my darker eye makeup. I have the Volume Black version; however, this mascara also comes in lengthening and waterproof formulas too! On the right is the latest eyeliner I’ve picked up – the NYX Vinyl Liquid Liner. I saw this in a video from Cherry Wallis ages ago and have been intrigued ever since – vinyl effect eyeliner?! My plan for this is to wear it with super light eye makeup to maximise the impact and shine. I’m super excited to wear it on a night out – I’ve tried it already, and I absolutely love it. It’s so easy to apply – it can take me a while to get used to new liners, but this one is great. The brush handle is really long and thin, and the brush itself is thin without being too flimsy. It might take me a while to get used to having a shine to my eyeliner though! Finally, we have my lip purchases! 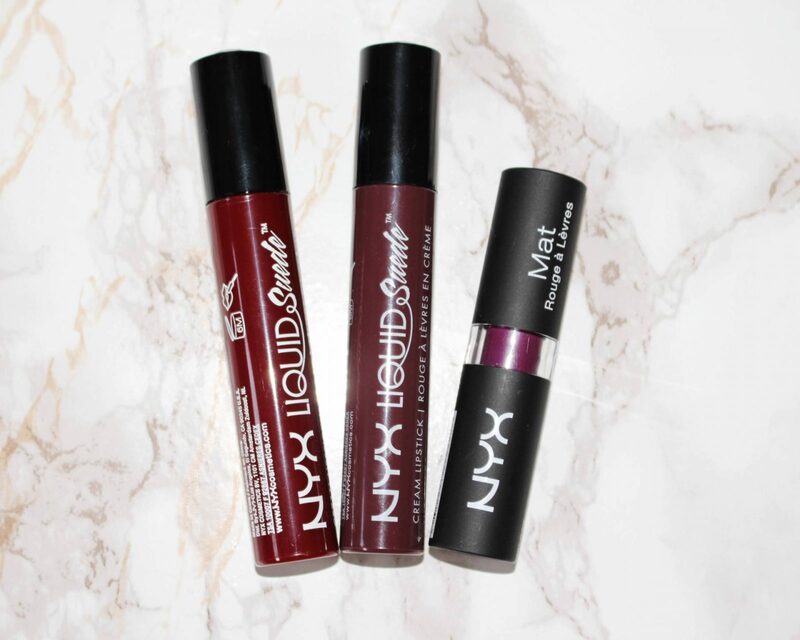 The lip products were the main reason I wanted to check out NYX – I’d heard so many good things about their lip range. Liquid Suede was the range I’d heard the most about, so I initially picked up NYX Liquid Suede Cream Lipstick in Vintage (the middle one). I’ve worn this a few times, and I seem to receive lots of compliments whenever I wear it – apparently dark lips suit me?! I loved it so much, I picked up another the next time I was in store – this time I’ve gone for Cherry Skies. The tube appears to be slightly reddish-brown, both in the photo and irl – not that different from Vintage! However, when applied, it also has a slight berry undertone which differentiates the two shades. The best thing about these lip products is that they dry matte – I’m obsessed with them already! My final product is the NYX Matte Lipstick in Aria. I’m still loving my berry lipsticks for autumn, just like I was last year – and I couldn’t resist picking up another one. Admittedly, I haven’t been wearing this one much – it doesn’t apply quite as dark as it looks here, which I was little disappointed with. That being said, it’s still a gorgeous matte shade – and you can never have too much berry!